If you’ve ever had a MacBook Air or MacBook Pro’s battery disappear at random it can be a disconcerting feeling. This is often accompanied with the battery menu having an “X” through it and saying “No Batteries Available”, a very sluggish Mac, and even after a reboot or not the Mac will often have fans running at full speed despite nothing unusual showing up in Activity Monitor. To top it off, the MagSafe charger light typically is not lighting up, and the computer won’t even sleep. Uh oh, something is terribly wrong, right? Well, sort of – but don’t worry, this is all related and it’s a peace of cake to fix. Before getting into any specifics or the details, let’s cover the solution: an SMC reset. This is a technical process but it’s very easy to follow. This will be the same on a MacBook Air & MacBook Pro Retina, technically any Mac with a built-in non-removable battery. You can find instructions for other Macs and older Macs here if needed. Note the total elapsed time in the clock is 2 minutes. In other words, it took only two minutes fix the entire problem, from adding up all the power-related issues, saving an important file or two, shut down the Mac, reset the SMC with the aforementioned keyboard sequence, then reboot the Mac to normalcy again. It’s important to point out that resetting the SMC will cause you to lose many power-specific options and customizations you may have made to OS X with System Preferences, ranging from screen brightness levels, to settings in Energy Saver for how the Mac handles things like auto-dimming based on lighting and power sources, screen sleep behavior, sleep when idle, etc. Thus you will have to go back and make those minor power customizations again. You won’t always find an exact reason as to why the system management controller goes haywire along with core system and power functions, but the basic idea is that at some point something was corrupted, maybe for a reason or maybe not. What is an SMC anyway? For those who don’t know, SMC stands for System Management Controller, and it handles power functions and other core hardware roles on Macs, thus inexplicable issues with power management are almost always resolved by resetting the SMC. This is why for problems or oddities with power management like batteries disappearing, refusal to sleep, a very sluggish Mac combined with system fans blazing loudly, graphics cards acting up, are all very classic symptoms of needing to reset the SMC to get things back on track. Take the time to do it, it works. Having run into this twice on two different Macs in the past week it’s certainly a worthwhile topic to cover, even if it’s a relatively rare problem to deal with. At the very least, it helps to be informed of these kind of things, so if any of the above happens to you, before calling AppleCare or taking a trip to the Genius Bar, take a moment to reset the SMC yourself, it will almost certainly fix the issue completely. Thank you so much – didn’t even have time to panic before I found your fix! Same! Worked like a dream! Thank you guys! This thing really works! It took me like 1 minute for the laptop to be fixed, and before that I was panicking. Thank you! 08/09/2016. OMG SO HELPFUL I THOUGHT MY COMPUTER WENT CRAZY AND WAS GOING TO EXPLODE! This was the soluction that I was looking for! Problema na bateria macbook air não liga, agora liga!!! I was ready to pay someone to fix the machine. I can’t believe it was this simple. Thank you for so much covering this fix. Thanks. Worked like a charm. Great article! Easy to follow and worked perfectly. Same here – nothing happens, I also tried it in different ways and constellations, and no change in settings or anything. This one is MBP mid 2010. Is there some other way to achieve this? Thank you so much for writing this!! Hi, I have a mid 2010 13inch Macbook Pro. My fan is on full blast all the time. The Macbook doesn’t appear to be warm, let alone hot. I also have no battery. tried changing it but still.. no battery. Tried the SMC but no luck unfortunately. I’m thinking a sledge hammer might do the trick? Thank you SO MUCH for this fix information. No worky!! I get the battery, but is never charges, just stays at (0%). Amazing! Thank you so much for this useful tip! 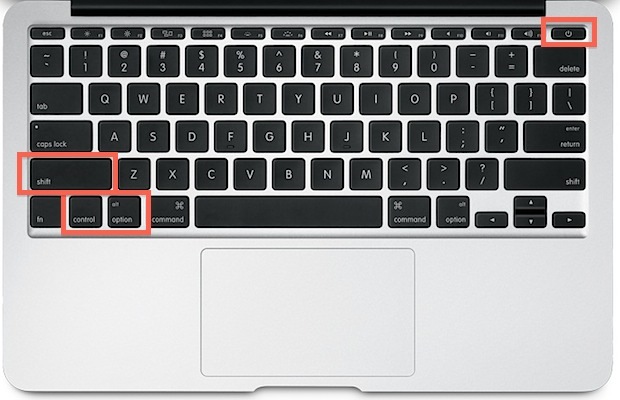 My Macbook doesn’t switch on anymore after following these steps. Any solutions? I unplugged the battery cable in the middle of the computer and plugged in again. Just remove (unscrew) the back cover, unscrew and disconnect the battery plug. It works for me. Thank you sooooooooo much. I can relax now! Thabk you sooooooo much. I can relax now! Some guy at the apple store told me that I spilt water on it and that it was going to cost 600-700 dollars to fix. I brought it home looked it up and literally pressed 4 keys and it’s fixed. THANK YOU!!! Thank you so so much. You’re a lifesaver. I have the “no batteries available” error after replacing a battery with a new one. The SMC reset does not help. Worked like a charm! Thanks so much!!!! It worked exactly as you said it would. Thanx a million! Panic was about to set in… this solved the problem within 2 minutes. Many thanks, danke schone, merci beacoup, mucho gracias! and its still same as it was before..
im not sure if your computer is working right if it was beeping. how many times did you try it?i tried it twice and it worked the second time. AWESOME!!! Worked like a charm. Thanks so much for posting this. AWSOME! i thought my computer would never work again! OMG!!!! THANK YOU!!! I like to think of myself as a tech-savvy mac junkie, but when my MBP Retina started to go haywire for no reason, stopped recognizing the battery, and even the power connector wouldn’t light up, I was as helpless as my great-grandma would’ve been if asked to troubleshoot an iPad! This was a life saver, so simple, yet so effective! The article’s being saved to my Evernote, and I’ll have to do some soul-searching: maybe accept I’m not as “tech-savvy” as I used to believe… :-) THANKS AGAIN!!! Thank you Paul. It worked great. THANK YOU VERY MUCH!!! I tried this and it worked! Thanks soo much. This was exactly the right fix!! I just did this and now it won’t turn on at all… help. Thank you so much. Worked like a charm. awesome!!!! waoooooo……,OMG VERY EASLY ACCORDING TO INSTRUCTIONS.thanks..
My mom just bought a new MBP in Atlanta and it started acting up. She came here to help out with our new child and just said it was broken lets go to Apple. We went to Apple and of course its like a week wait to do anything (I totally forgot to schedule an appointment). So I decide to take some time to figure this out and the problem was exactly as described in this article. The fix provided worked like a charm. I cannot say enough thanks, my mom is super happy!!!! Wow thank you! I thought my laptop was messed! Worked exactly as stated above! thank you! Perfect. Thank you so much. saved my day. Thank you very much. Very easy fix indeed.. Thank you soooo much, I did exactly what you said and presto, bat x gone, magsafe light back on. Thank you so much. Simply followed your three steps in my MacBoo Pro with Win-7 and it solved my problem. Amazing – thank you so much – and thank you for illustrating with the picture! I had read the SMC reset instructions elsewhere but obviously kept getting it wrong because I was pressing the ‘cmd’ button under the mistake impression that was the ‘option’ button! Was thinking my macbook must be immune to the SMC reset! Saved me a boring and inconvenient trip to the Apple store and a lot of stress and anxiety! Wow! I was worried. and it worked like a magic. Thank You! You made my day! Thank you! Very useful I was freaked out to go Apple Store and pay couple hundred dolars and you guys help me. OmgThank you!!!! So easy. I had tried previously with no luck but apparently just had the keyboard sequence wrong. Thank goodness. Sometimes problems arise and theres no solution in sight or should that be on sites, or, the solutions given are impossible to follow, or don’t work. This wasn’t one of those times. Your solution worked like a miracle, it truly was amazing. Miracle, I can’t even tell you how happy seeing the charging light come on made me! don’t know who you are, but ur the man. TU, TU, TU, regards man! Thank you so much it worked like a charm!! Thanks for the tip. I was worried as to how much it was going to cost me to get this fix. Thank you so much for the fix! My Mac works excellent now! This just happened to me on a Dell Windows laptop, any idea on how to solve it on a non-Mac? a word of warning!! the advice above is sound…. for a while!! iv had this problem for five months now and the above advice helped but I found i had to reset every few days. Now the machine completely ignores the key commands and goes into safe mode. my problem is the keyboard keys only work in upper case and keys for most programmes are garbled. it sounds like your Mac is overheating and maybe is getting damaged, it has nothing to do with the advice. You should take it for repair. Thanks man… you rock it! Just tried this and still nothing. The battery displays and X and the fan is going. The computer works when it is plugged in, but very very sluggish. The light on the charger stays green, not turning to orange like when it is charging. I have a MacBook Pro from 2011. Any other suggestions? Travelling for work far away from the mac stores and this just happened to me, I was ready to really panic, but your solution worked, amazing, thanks so much!! The fans are very loud (maximum) It says no battery, no orange or green light on MacSafe adapter. What I did was pram reset SMC reset al logo read many webpage and al the suggestions goes to the SMC reset. Tried several boot methodes but what did work was a tip i read from this support forum. remove battery remove MacSafe, hold down power button 10 sec, the reconnect MacSafe adapter, stil holding power button down and now for another 10 sec, release it and then startup the normal way. The MacBook Pro booted “normal” but with loud noise from the fan (maximum) I started again in safe mode and repair permissions, booted again and still Loud noise. All the time the light on the MacSafe adapter was OFF. The MacBook Pro is normal working but with loud fans and only with the MacSafe adapter attached. The battery is replaced 2 years ago. It would not charge and was bolded, now it is in good shape from the out side. When I push the button on the the battery the lights ar not lighting up. Question if I buy a new battery, could that solve the problem? I don’t have one nearby, so I will have to buy it. Thank you so much. My Macbook Unibody 2008 works perfectly now! THANK YOU SO SO SO MUCH! You’re a life saver lmao. I was panicking but then I got on your page thankfully!!!!!!!! Thank you so much. I love you. DUDE, SERIOUSLY, i feel like i should cut my arm or my leg right now and mail it to you.. my friend job well done. indeed. Thank you, thank you, THANK YOU! I was in full blown panic mode. Currently finishing up my masters dissertation and then this happened. I was about to cry and then saw your article and everything seems to be working well again. You are a lifesaver. I never comment on these types of things, or anything at all to be honest but I really do have to thank you. I got extremely frantic, thinking I had to go to the apple store and pay a fortune to get it fixed, but thank God I stumbled on your website before I did. Took a minute and now my macbook pro is alive once again. THANK YOU!!! Thank you so much!! Worked like a charm. And no trip to the Apple Store!! Thank you very much ,it worked !!! Awesome!!!! Thank you so much. Thanks for these, I help my friend fixing his macbook air when the technical from Apple just telling him that it needs overhaul cleaning to fix it and requires them 5 days when it can solve within seconds. That apple care center must need retraining for their technicals. Thank you for much for this! Faced the exact same problem, tried your solution and it worked like a charm. Thanks so much!!!! So thankful for this fix!!! It was so easy and when it rebooted I almost forgot how quiet my mac used to be!! Thank you – utterly wonderful – thought my macbook pro had finally had it, and now so relieved. Your advice greatly appreciated. Thank you thank you thank you! Stopped that sinking feeling in my heart and wallet simply and quickly. You are a life saver my friend. Thanks you for posting this. My cat sat on my Mac’s keyboard and in the morning the computer was all kinds of messed up – WiFi wouldn’t connect, the battery symbol displayed an ‘X’ and so on. This procedure fixed it! Thanks! Wow. That so worked. Thank you. Worked perfectly on a mac book pro. Saw your headline and went right to your link. Every symptom was exactly correct. Thanks for sharing bro my wife thinks I am like a super genius now. Thank you, thank you, THANK YOU!!! I read articles all the time that don’t work, but this one worked brilliantly. Whoever wrote this article, you are amazing. Thank you! Thank you! Clear, concise, and accurate. The right fix for the right problem. it worked! it worked!!! thank u sooooooo much!!!! Thanks mate, works a treat and got my keyboard backlight working again too. I am afraid, it did not work for me, followed all your instructions, unplugged battery, re plugged, Held Shift+Control+Option+Power concurrently for a few seconds, nothing. However, when I hold down shift control, it starts uo. Plug gives me a green light, but cannot charge battery. I have the same problem with my MacBook. Many hours wasted so far trying to fix. Reseting SMC did not do the trick for me. THANK YOU! This saved me a grueling trip to the apple store. You rock!! Awesome… This just worked perfectly on my macbook Thank you for this thread. This is awesome i though my computer was really broken but then i heard it was happening to others it made me feel just fine and now my macbook isn’t making a loud Vooming noise and it has stopped it annoying Turning off while charging! Hello! This is the first time in 5.2 years with the Mac Air. Incredibly simple and easy. Thank you so much. Strange but today I got some files from an infected USB (from a Winbugs computer), I was not able to read the files, I say 2 files instead of 3, then the person used a single.ZIP file, then the ZIP, once unzipped showed another .ZIP file, not the 3 original files, we had to format the thumb drive. Macs can not get Windows viruses. Mac is entirely immune to any and every Windows virus, so the data on the USB drive from Windows would have no impact on the Mac. OMG! i was flipping out because all of the sudden one afternoon this happened, and my little apple on the outside of the computer wasn’t turning off (the light) and i was getting really frustrated, and i looked this up and this fixed it right away!! I normally don’t leave stupid reviews.. but this made me so happy! Thanks for the help! P.S. If anybody is wondering, you don’t need to buy a weird adapter thing, it worked for me by just shutting down and holding shift control option ad power for like 20 seconds. Thanks! Great, after doing this my mac won’t turn on at all. Thanks a lot literally made the problem as worse as possible. Thank you.. worked like a charm..
Curse you!! The fix worked perfectly and now I won’t be getting a new rose gold air. Dang it!!! The problem with me happened after a malfunction on magsafe. A little trouble with my power source. After the forced shutdown, maybe the mac protection against mal function, the new boot began with theses troubles (fan always on, missing battery). I made the procedures and with a new power source (the old didnt work more) all turn back to normal. I had fear of burning magsafe board, but nothing happen. Just reset things and mac is working fine. I, having a notorious history of terrible luck with technology, was not expecting this to work for me at all. It did. I’m honestly amazed. Thank you so much for this! Thank you, It is back to normal again. This might be a silly question, but i’m always worried about this, if I follow your steps will any of my files be accidentally deleted in the process? Thanks! Super helpful article and works perfectly. Thanks!! Just adding my name to the long list of thank yous. You da best!! It worked! This saved a lot of time effort and money going to the shop! AWESOME!!! THANK YOU!!!! WORKED LIKE A CHARM!!! Thank goodness I found this!! An amazing fix…I’ve been struggling for ages to resolve these issues….. Thank you!! this is absolutely MAGIC!!!! THANKS A LOT!!!!! Worked perfectly. Thanks for taking the time to post. Mine turned out to be a swollen battery. Being replaced at no charge under AppleCare. Works like a miracle! Was about to crash… thanks so much for writing this! OMG THANK YOU SO MUCH! My dad thought I gave the computer a virus from steam and was sooooo pissed, but thanks to you it’s back to normal!!! THANK YOU!! It worked like a charm and was so quick and easy. What a relief!!! The best I think would be just to keep your Macbook Pro charged as and when it is possible to not wear down the battery in the first place. It is a myth that plugging in the charger all the time will diminish your Mac’s battery life. When the power is full, the Mac draws power from the Magsafe charger. In any case, you can always go for battery replacements at independent Mac repair centres which are a lot cheaper than Apple stores. I have tried the SMC resets and it almost never works. Once the service battery prompt appears, the battery life diminishes very fast. Thank you! Didn’t have to spend $$$ on an easy fix.. Thank You! Thank You! This started happening when my computer was at 1% battery, so it ran out of battery and it won’t charge because of the no battery thing. How do I fix this? THANK YOU SO MUCH, I WAS JUST ABOUT TO PAY LOADS ON FIXING IT. Thanks so much! I was worried and kept restarting it for no reason and this worked perfectly!! Thank you! Saved me time, money, and the need to worry! What if SMC reset won’t work? The problem with my macbook pro retina (early 2013) is it stopped turning on the normal way. it won’t turn on with power cord already connected then pressing power. it will only turn on by pressing power button followed by connecting power cord with noisy fan all throughout. Battery info not showing from “system report” or even when doing Diagnostics. Tried to reset SMC many times, nothing happened. I tried to disconnect/reconnect battery cord from board, still did not fix the issue. Is it that battery needs replacement already ? Will it cost me to have an Apple Store tech confirm the issue? Thank you soo much… Appreciate any comments from you! Thank you! This reset it, which is a good thing because it was driving me crazy. There yesterday, gone today. My OCD can’t handle that lol. Thanks again. Thank you! This reset it right away, which is a good thing because it was driving me crazy. There yesterday, done today?! My OCD can’t handle that lol. Thanks again. I felt so happy after fixing that, I was getting really worried. That did the trick!!! THANKS SO MUCH!!! Dodgy (worn out) charger cable shorted my computer, and when it restarted, it said “no battery available” (but still, somehow, was running on battery power). I also couldn’t get the (good) charger to connect. After holding down those keys, the charger light lit up and I have battery again! Thank you for this info – worked for me! Saved my day too – thank you very much! THANK YOU SO MUCH! I was panicking, even thought i might need to get a new laptop. this worked for me. again, thank you!! Thank you sooooo much… I was really panicking when the laptop just shut off after doing some silly stuff… I was already wondering how much this will cost me until I found this very helpful troubleshooting steps you’ve provided. Awesome! Thanks alot! You are really good it worked like magic .Thnk you so much i appreciate you. This repair seems to have worked now, but after 2 attempts of holding Shift+Control+Option+Power buttons. The first time, my MacBook Pro (early 2015) restarted with the same problem- loud, continuously running fan, no battery icon in menu bar and no charge via power cord. I did the same thing a 2nd time and it seems “magically” fixed. Fan is totally quiet, power cord charging and battery icon reappeared in menu bar. Thank you so much!!! I thought my Mac was going to explode and die. does anyone respond to the complaints about it not working? My MBA still shows the X. I call shenanigans. Wow, super helpful information. My cat chewed my power cord and caused a weird short that shut my Mac off. When I turned it back on, the fan was going crazy and there was a no battery sign. I thought that both my cord and Mac were dead…almost panicked and then I found this post. Thank you!! I was stressed out for a few minutes, as when I powered on my computer, I noticed the “No Battery Detected” sign, that the MagSafe charger light was not on, and that the fan was loudly blowing. However, I then found this INCREDIBLY HELPFUL PAGE. Such an easy fix and so well explained. Thanks. Thanks Thanks! i couldnt sleep was thinking how could this be. I am the type who never liked to post such AS this. It helped me. I appreciate you so much!! This works if it is a software or simple firmware SMC/VRAM issue, but if this does not work to resolve your ‘no batteries available’ message on a MacBook Pro or MacBook Air then that means the battery has failed and needs to be replaced. Thanks for this, it helped big time! I tried this and now my laptop won’t turn back on. Like at all. Any advice? I’m freaking out a little? Plug in your laptop to a charger, reset the SMC, then turn it back on. Sometimes you have to let the Mac stay plugged in for a few minutes before turning it back on again. That also might mean your battery is no longer functional if it does not turn on when the power is not plugged into the Mac laptop. Make sure the power outlet works of course. Many years later and it still works! You are a life saver!! Thanks Thanks Thanks!! !